You see, if I didn't have a blog I could just throw Black Lace Cardi in a corner and go on with my business. I wouldn't have to go through the painful explanation as to why it didn't work out. But I DO have a blog & you all were expecting a finished cardi today. You almost had one too. All the pieces were completed and the sewing up had commenced. However, I'd made the mistake of crocheting the pieces to the measurements given in the magazine, blithely assuming everything was working out as it should. Unfortunately, it wasn't. The instructions call for 8 1/2" armholes for my size. Perfect. :) Then for the fronts, the instructions say to decrease for the armhole & work 6" before starting the neckline shaping. Then they have you do about 3" worth of shaping before "working even until the armhole measures the same as the back." THEN you have to do two more (shortened) rows to do the shoulder shaping. You really need to stop right there, after the 4 neckline shaping rows, to make the armholes match. BUT, that would make the neckline very, very high. 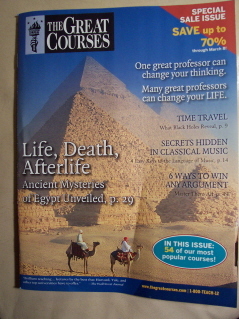 Definitely higher than the one shown in the magazine pic. Let me make a note here: I DID check to see if the armhole was measuring the same as the back....but....the way the back armhole decreases work gives you one side that is considerably larger than the other. Did I notice? Yep. Did I think it would work out in the end? Yep. Was I wrong? Hell, yeah! Wanna bet which armhole I measured against for that 1st front? Yeah - the LONGER one. Sigh. 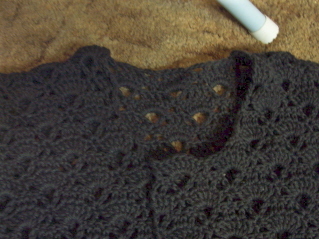 So I found the problem on one side, unpicked the seam since I'd already sewn the fronts to the back, THEN found that the neckline shaping was wonky on that side so I ripped on down & re-crocheted it. I sewed it back on and what did I find? 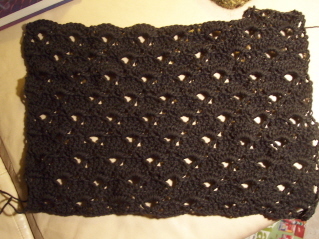 The overlap is over 3" as it is - it will be almost 5" with the edging added. If I DID put buttons on it, it would be too big & sloppy to wear - at least to my taste. 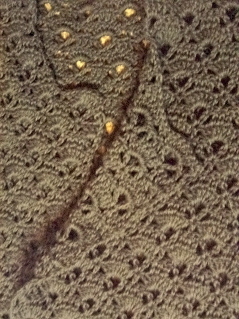 I am absolutely NOT bragging, but after 35 years of steady crocheting it isn't very often that I have to rip. And I've had to rip with this pattern at least 4 times. 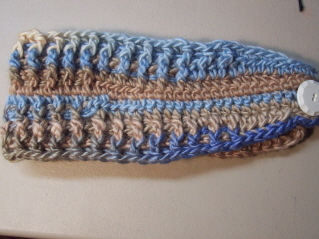 The sleeve directions don't add up somewhere around row 7 of the sleeve cap shaping so I had to wing it. I wouldn't call anything but the armscye measurements actual mistakes, but you have to watch what you're doing very carefully and some of the "reverse shaping" instructions can be confusing. When I saw the wonky armscyes on the back, I should've stopped right there & re-done it, changing the shaping instructions so that they were equal on each side. My bad. I will say that the sleeve cap directions might be screwed up 'cause I certainly couldn't make what they were saying work with what I had in front of me. Part of the problem is that one some rows they count the first dc as the one below the turning chain and on other rows the "first" dc is the next one after the turning chain. I just had to look at my crocheting & figure out what came next from the pattern, not necessarily the directions. Oh - and the sleeve cap instructions have you keep going until the length of the cap matches the uber long armscye of around 11" rather than the one you should be matching which is 8 1/2". So I crocheted the sleeve cap for the size small rather than the XL. In rows, that is, rather than width. Am I going to fix it? Nope. Honestly, I'm sick of the pattern & sick of the yarn. I don't WANT to rip out the fronts for what would be the 3rd time, especially if the finished cardi/coat is going to be too big for me to wear. I just don't want to freakin' fix another project. The pattern is very tweakable, especially if you'd like the band wider on your head. :) I'll write up the pattern today & post tomorrow. 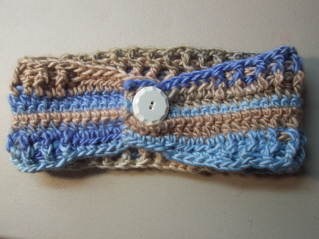 While I'm at it, I'd like to name this something other than "Crocheted Calorimetry" since "Calorimetry" is rather specific & unusual enough to be attached only to the original knitted design. So - what do you all suggest as a name? I'm fresh out of new ideas. Let me know!